WordPress is superfamous, and everybody knows it. It is said that nearly 30% of websites in the world are powered with WordPress, which is absolutely impressive number. However, being suitable for building websites of any kind and the most dominant Content Management System (CMS) in the world doesn’t mean it is the perfect tool for everybody who is about to create a website. Obviously, WordPress is not the one of a kind. There is still an enormous amount of website builders out there, which may satisfy your needs to a greater extent and provide exactly those features, which you are looking for. So, if you are interested in what you can use instead of WordPress and how it works, here is the list of 11 WordPress alternatives which can definitely come in handy. Joomla is often said to be one of the best CMS platforms available and the biggest competitor to WordPress. It is a free, multilingual, multipurpose, and open source Content Management System. It offers strong set of features and is quite similar to WordPress. In such areas as user management, user groups, and contact management Joomla beats its strong competitor. This CRS provides its users with great choice of extensions and themes. Unfortunately, you have to pay for most of them. This website builder works for any type of websites – online stores, blogs, official, corporate, governmental sites or social networks, and it suits well for those, which have a lot of content. It has large community and millions of users. However, Joomla may be felt even more technical comparing to WordPress, and difficult to work with for users with limited technical knowledge. Drupal is one more serious competitor to WordPress, which is also often called its biggest contender. It is another open source, highly technical, and hugely popular CMS. However, there must be enough technical knowledge and skills to operate with Drupal. At the same time, it is a powerful website builder with a solid collection of features and add-ons. What is more, Drupal is fast loading, highly secure, and remarkably multilingual. It is free but requires looking for web hosting. Usually, this CRS is used by large-scale organizations with enormous technical resources. The websites of The White House, Oxfam, The Economist, Fox, and many others are powered by Drupal. Overall, Drupal is more technical for WordPress and is definitely not a good choice for people with lack of technical knowledge. But if there is enough technical competence, advanced and huge web projects may be developed with help of this CRS. Wix is a very popular WordPress alternative, which offers you “creating stunning website for free”. It is not open source, and while being a website builder it also serves as a website hosting service. Wix has an extensive collection of pre-made designs – more than 500 templates. Its drag-and-drop editors make the process of modifying the templates much easier. It also has pretty large app market for increasing website’s capabilities. When it comes to e-commerce, Wix offers Premium plans with a possibility to accept payments online using PayPal or Authorize.Net. Moreover, this website builder comes with industry-specific tools, which help to create something really suitable for your area. In addition, Wix keeps pace with the latest trends constantly adding new features and updating its designs. If you face some problems or just want to ask something – you can contact its support team via mail or phone. However, with built-in hosting solution you receive limited control over your website. Squarespace is a website builder solution that can serve also as a hosting service, blogging platform, e-commerce store builder or portfolio base. It comes with a lot of features and makes it easy and intuitive to build a website. The interesting part about this WordPress alternative is that it is highly design-focused. Squarespace enables creating beautiful, stylish, and elegant websites. That’s why it is perfect for portfolio, design, restaurant, fashion, different celebrations industry, where it is crucial to impress visually. It offers plenty of modern and good-looking ready-to-use templates, and allows using different templates on a single site, and drag and drop builder, which makes modifying the templates quite easy. At the same time, Squarespace can be difficult for those not experienced enough in design. As in the case with similar options, providing functionality of a hosting service doesn’t let you have total control over your website. What is more, Squarespace charges its clients some fees. Depending on what you need to build, there is Personal plan for $12 per month and Business Plan for $18 per month. Weebly is one more completely hosted online website builder. As Weebly positions itself, it is “surprisingly easy to use”. And this platform is actually about making website building available for everyone. Its learning curve is very smooth so making your website does not take much efforts, it is an easy and intuitive process. Probably, Weebly is the easiest website building solution out there. Obviously, this solution won’t offer you truly comprehensive and gorgeous set of design templates and high level of customization. Nevertheless, it has more than 100 pre-made design templates, and this number is constantly growing, drag-and-drop web page builder, e-commerce, and blogging modules, complete optimization with mobile devices. It’s good for the single purpose and straightforward sites, such as portfolio or business card. Weebly provides its users with a free version, which includes only basic functions and probably will not be enough, and also paid ones from $8 to $49 per month. And, like in other similar cases, complete hosting gives some restricted control over your website. 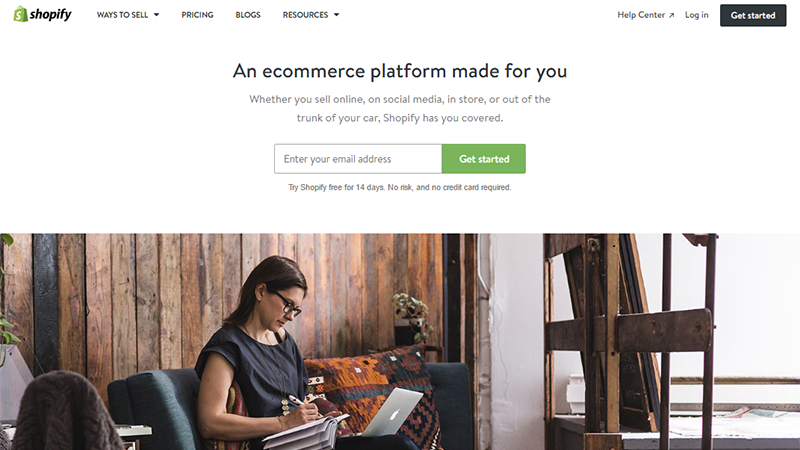 When it comes to building an online store, your choice may come down to Shopify. With thousands of stores all over the world and billions in sales through this platform, Shopify is probably the most popular online store builder solution. With this website builder you are able to set up a store of any size – from small to big ones within a short period of time. The obvious advantage of choosing this option is that it is a hosted e-commerce platform, and all the technical aspects of running it is not your business, so you can concentrate on issues that are more important. Therefore, building an e-commerce website with this tool is easier than using WordPress. On the whole, this platform offers advances e-commerce functionality, more than 100 fascinating, fully customizable and mobile-friendly template themes, hundreds of apps to expand your standard Web store and increase its capabilities, 24/7 support via phone and email, and many other useful features. Nevertheless, Shopify is not a free platform, offering several plans with different functions and prices ranging from $29 to $299 monthly. BigCommerce is another hugely famous e-commerce website builder, often considered to be the biggest competitor to Shopify. It is mostly popular among small- and medium-sized Web stores. This online store builder offers you more than 100 templates, more than 150 integrations (Google Analytics included), mobile apps for Android and iPhone, easy integration with eBay, Facebook, Google Shopping, around-the-clock support via phone, mail and chat and other useful options. Just like its biggest competitor, BigCommerce also has App store for adding more tools. BigCommerce pricing system may look a bit confusing, including free 15 days and various paid plans for emerging businesses and already established brands. ExpressionEngine is complex and capable CRS with a powerful set of features and extensive content management functionality. It is PHP and MySQL based platform, which offers anti-spam tools, traffic analytics, templates, advanced admin features and user management, set of build-in modules, customer support and many other features. But, if you want to get well with ExpressionEngine you have to go well with code. The main specialization of this website building platform is close to Joomla or Drupal – creating website projects with progressive content management functions. There is a basic free version of ExpressionEngine but the set of features it offers is so limited that in most cases it probably won’t be enough. Moreover, it offers a number of add-ons but a lot of them need to be paid for. Considering ExpressionEngine is extremely complex, heavy on features and not easy to learn, it is perfect for big volume websites, which require extensive functionality and advanced content management. Jekyll is a static site generator – it takes text content and turns it into a static HTML site. It is a solution for developers because here you have to deal with the code and be aware in HTML programming. This platform is about being simple, static, and blog-aware. It creates Markdown and Liquid Templates using your text files and generates plain HTML static documents from them. Jekyll is fast, requires no server maintenance and, what is really important, provides free hosting using GitHub pages. Therefore, this site generator is a great option for those, who need a fast loading publishing platform, are able to work with the code for it and look for a free hosting. Blogger is a free hosted blogging platform provided by Google. The thing that Google is the company, which owns Blogger brings its advantages, such as ability to sign up with your Google account, integration with Google +, Google AdSense, Google Comments, and Google Communities. It is really easy to start your blog on Blogger, since it doesn’t require any technical skills at all. This platform offers a range of valuable functions and features, including commenting system, social capabilities, a collection of various templates, some level of customization, traffic statistics, basic layout editor for modifying such elements as sidebars and navigation, etc. Blogger works great when you want to create an amazing blog having no e-commerce plans in mind. Therefore, it is not the best option to make business. Ghost is a NodeJS based blogging software platform. It is not complete CRS and advertises itself as WordPress alternative but only with blogging in mind. Ghost clearly outlines its key area so any features or extensions you find there are made only to make your blogging experience better. This way, it doesn’t encompass a lot of functions so it is not an option for enormous website projects or business sites. However, if your goal is to make a good-quality blog, it will be there for you. Ghost offers easy-to-use interface, quite intuitive working process, and split text editor with Markdown syntax, which allows you not to interact with HTML, in-built SEO settings and social sharing features, and more. Ghost provides its users both with free version, which can be downloaded from site and installed, and paid packages with more features and functionality ranging from $8 per month to $200 per month, depending on the plan you choose. Of course, this list is far from complete. There is still a huge number of website builders, which in different ways may serve as alternatives to WordPress. The main point to remember is that there is a great deal of various website building platforms beyond WordPress. All of them have their special features, level of complexity, functioning, prices, and, of course, benefits and drawbacks. So if you are about to create a website project there is a range of possibilities in front of you. I hope that this article has helped you in the pursuit of that perfect WordPress alternative you are looking for. What you need to know about building MVP What are the characteristics of successful startups?